After 67 years in the religious life, Sister Jeanne d’Arc Kong died peacefully at St. Paul’s Hospital on Sunday, 20 April 2008, at the age of 90. Sister Jeanne d’Arc was born in 1918 in Fuzhou, China. She joined the Sisters of St. Paul de Chartres in Hong Kong in 1937 and after her profession was assigned to the provincial house and St. Paul’s Hospital in Causeway Bay, to take care of the kitchen. From 1961 to 1978 and, again, 1982 to 2000, she was in charge of the kitchen at St. Teresa’s Hospital, Kowloon. 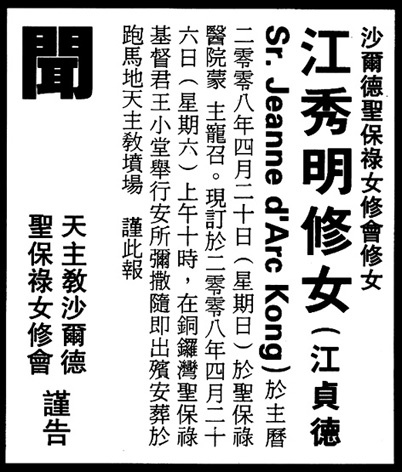 In 2000, Sister Jeanne d’Arc retired to St. Paul’s Convent, Causeway Bay. A Mass of the resurrection was celebrated on Saturday, 26 April, at Christ the King Chapel, Causeway Bay, and her body was buried at St. Michael’s Catholic Cemetery, Happy Valley. The Sisters of St. Paul de Chartres kindly request your prayers for the repose of her soul.